Home / Inputting & Exporting Data / How Do I Input a New Projection? How Do I Input a New Projection? To input a new projection, select “New Projection” under “Data Input” in the navigation menu. We have 6 types of commonly repeated entries. Choose from amounts to percentages. You can use these and adjust the dates to make the kind of repeat cash projections you want. Fixed: Generates a fixed amount every iteration. Range: Generates a random amount between given min and max values every iteration. Fixed Change: Generates a constant amount change every iteration. Fixed % Change: Generates a fixed percentage change every iteration. Random % Change: Generates a random percentage change every iteration. Cumulative % Change: Generates a cumulative percent change every iteration. Cumulative Random % Change: Generates a cumulative random percent change every iteration. Within the New Projection entry, you can also choose your frequency. 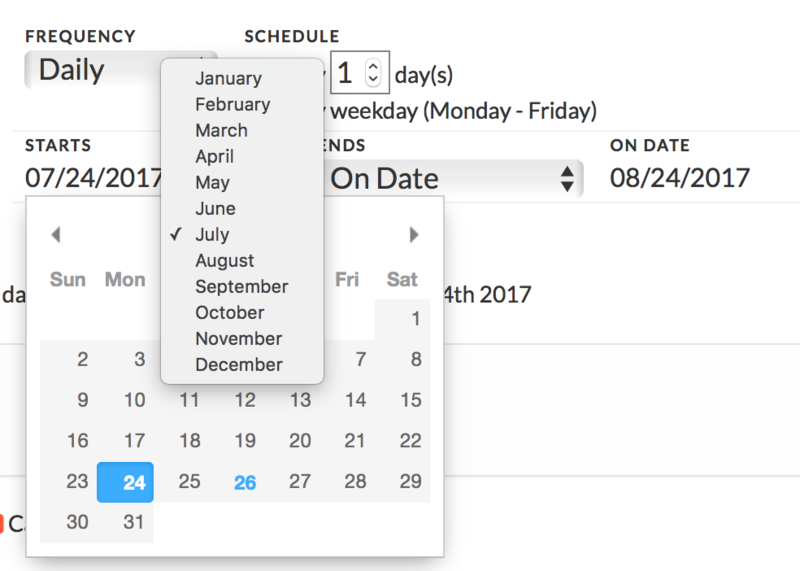 Click the drop down arrow to bring up the possible choices: Daily, Weekly, Monthly or Yearly. Choose the type frequency you need for your entry. 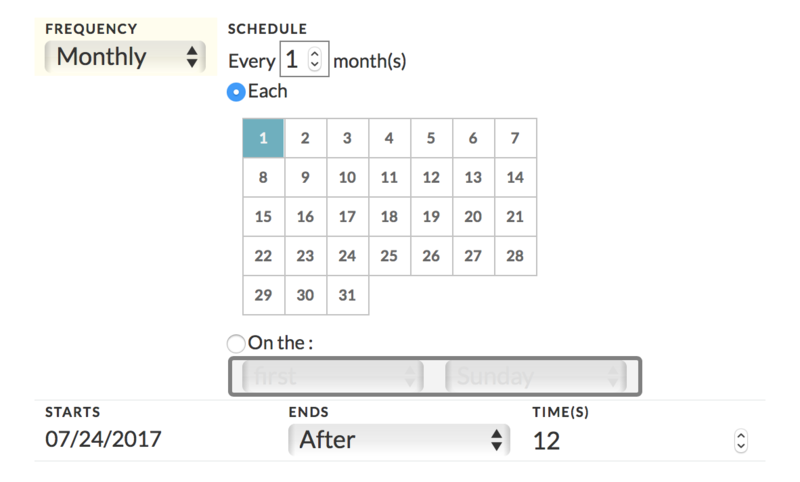 Once you have selected the frequency of your entry, you have the option to devise a more detailed schedule of the entry’s frequency by editing the number of days/weeks/months/years the entry shall occur on. If not a specific day of the month, you can choose a specific day of the week and which week of the month it falls in. After scheduling the frequency of your cash entry, you must enter a start date. 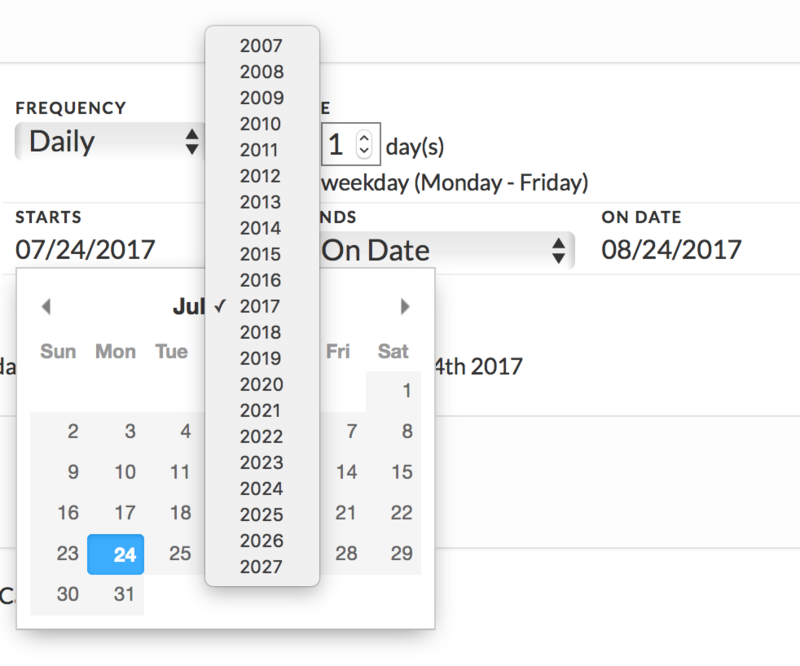 Clicking on the default date brings you to a calendar format. Rather than navigating through the calendar with the arrows, here are some shortcuts to selecting the month and year of your choice. Click on the month to select the month of your choice. Click on the year to select the year of your choice. Finally, select how your cash entry frequency should end. 2. End the frequency after a certain number of times (for example, after 2 whole weeks would be 14 times). How you input your cash amount and what information you need depends on your entry’s repeat type. This will result in repeating the same amount for each time interval. This is good for projecting expenses like rent or subscriptions that have a fixed cost and repeat frequently. Make sure your repeat type is set to Range. Enter your minimum value and your maximum value amount. The system will pick random numbers between your min and max amounts. This is good for projecting variable costs or revenue dependent on external factors. For example, revenue from sales every month or server utility and bandwidth costs. Make sure your repeat type is set to Fixed Change. Enter your amount and the change amount. Make sure your repeat type is set to Fixed % Change. Enter your amount and the change percentage. This is similar to the fixed change amount, but instead uses a set percentage rather than a set figure. Make sure your repeat type is set to Random % Change. Enter your amount and the minimum and maximum change percentages. This repeat type is used when you don’t have a set percentage change, but do have a range. Make sure your repeat type is set to Cumulative % Change. Generates a cumulative percent change every iteration. For example, if you started with 100 and a change % at +10 should produce [100,110,121,133,146, …]. Make sure your repeat type is set to Cumulative Random % Change. Enter your amount and the minimum and maximum change percentage. This is when you don’t have a set percentage change, but do have a minimum and maximum amount. What Is a Repeat Summary? How Can I Bulk Edit/Delete?